Last week we reported the sale of the 43.28m motor yacht Pure Bliss and now Churchill Yacht Partners send word that her new owners are reintroducing her to the charter market as Lady J. Designed by Tom Fexas, she was built by Palmer Johnson in 1997 and is Lloyds classed and MCA compliant. 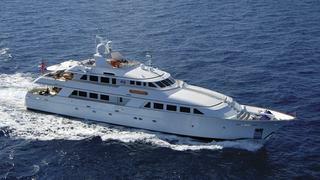 She can accommodate up to 12 guests in 5 staterooms including an on-deck master suite. Twin Detroit Diesel engines deliver a cruising speed of 14 knots and a range of 3,500 nautical miles, and she also features zero speed stabilisers. She underwent a major refit in 2008 and her previous owners spared little expense on her maintenance, so she is in great condition, but will now undergo several upgrades at the yard before making her debut at the Antigua Charter Show in December. Lady J will be based in the Virgin Islands and available to charter in the Caribbean during the winter from $120,000 per week, plus expenses.